The Caliph of culinary delight, the Sultan of the stove, Jerry Starnes brought in a harem filled car of friends and help to make this day better. Heart beat talk and heartfelt conversation was shared by many in known and personal experience. Our Tonkawa treasurer, Jean Vigenault returned to the Monthly meeting with her recent adventures fresh to share. We wish her the best of continued improvement and better future circumstances. Attending today was: Vickie, Jerry, Rita and his assistant Rachel, Barbara, El, Roy, Dennis, Nellie and Rose Davis who provided the blessing for this day. Thanks to Jerry Starnes for the Turkey with dressing thanksgiving meal with all the trimmings. There were fruits and rye bread and real butter, many exotic and familiar pies for all to enjoy. It is a blessed day when we can gather together in fellowship and with a potluck feast and most joyous to enjoy each others good company. 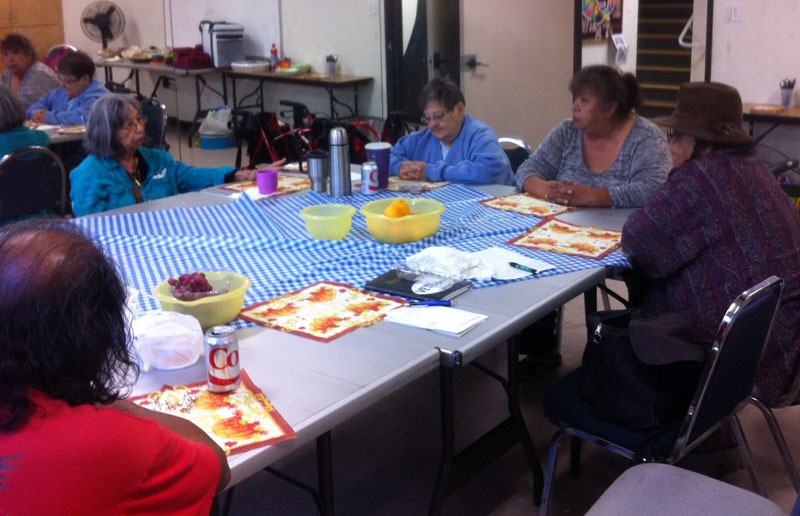 Vickie brought everyone up to speed on the Holiday dinner, Soaring Eagle dance workshop and the health issues of other members of the community. Tonkawa luncheon selections were all very tasty and healthy choices that added to the experience of community. Finally this day signaled the fall season as known in the San Diego finest climate. Everyone is welcome maybe we will see you next month, December 14, 2014.